Today we are announcing the general availability of Azure Logic Apps, Microsoft’s Integration Platform-as-a-Service (iPaaS) offering that enables rapid, enterprise-grade, hybrid application connectivity. At the Integrate 2016 conference in London, we shared our vision to build a comprehensive hybrid integration platform that allows customers to seamlessly connect traditional on-premises systems and cloud-native applications. Logic Apps forms an integral part of this strategy, and its general availability marks an important milestone for us in delivering against Microsoft’s Enterprise Application Integration vision. Why is Logic Apps important? Businesses are going through digital transformation. Applications, data and devices are proliferating. Agile enterprise integration forms the backbone of this journey, making it possible for companies to connect systems and optimize processes as they evolve. At Microsoft, we want to enable our customers by providing the right tools to deliver services faster and stay ahead of competition. With the launch of Logic Apps, customers can seamlessly consume SaaS and enterprise applications, unlock value from their existing on-premises systems and enhance their integration solutions to make informed business decisions. Integration has traditionally been a complex and tedious process. Logic Apps makes it possible to complete projects faster and iterate more efficiently by offering a vast set of out-of-the-box connectors that can help you integrate SaaS applications like Office 365, Salesforce, Dynamics CRM and many more within minutes. With a new visual designer, you can now spend less time coding and more time composing workflows that help automate complex business processes. Here is a sampling of the connectors available in Logic Apps. Modern enterprise IT is hybrid, relying on data across both on-premises and cloud. With Logic Apps you can connect to any existing on-premises system directly through our on-premises data gateway, giving you the flexibility you need to choose the most relevant integration strategy for your business. We recently shipped Enterprise Integration Pack Public Preview in Logic Apps, providing you the ability to work with trading partners across company firewalls easily and securely using standard enterprise messaging protocols. This significantly reduces the challenges faced when transacting B2B workloads with partners. We want to enable you to move away from building fragmented, costly integration solutions to a more holistic approach. 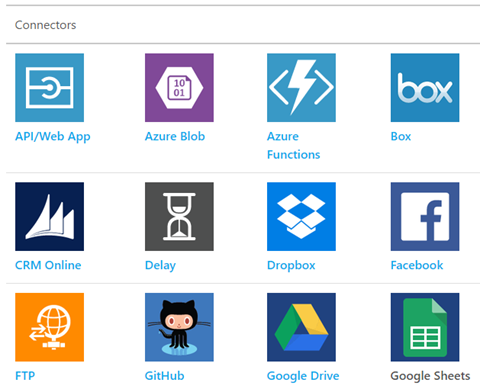 With Logic Apps’ extensive (and growing) set of connectors, you can expand your existing Azure Cloud solutions to gain actionable intelligence, automate processes, and make better informed business decisions. We make it easy to integrate Azure offerings such as Azure IoT Suite, Cortana Intelligence and services such as machine learning and cognitive services with Logic Apps. 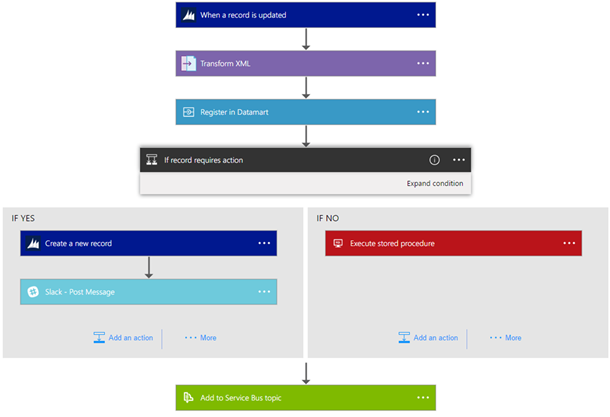 To get started, walk through a tutorial on using Logic Apps to automate email notifications when anomalous behavior is detected in your Azure IoT solution. Imagine the possibilities of expanding this with additional business processes made possible through Logic Apps. Logic Apps also works together with BizTalk Server to form the core of our enterprise integration story, along with our API Management and messaging service (Azure Service Bus). We recently shipped BizTalk Server 2016 Community Technology Preview 2 with many new features, including compatibility with latest first party platforms such as Visual Studio 2015, Windows Server 2016, SQL Server 2016 and Office 2016, SQL Server 2016 AlwaysOn Availability Groups and many more. Logic Apps and BizTalk Server are “better together,” making it possible to leverage current BizTalk Server investments to connect to SaaS applications. You will see more of these capabilities highlighted in our upcoming BizTalk Server 2016 release. Finally, we’ve also made enhancements to the purchasing options for Logic Apps. Our customers told us loud and clear that they wanted flexibility in how they purchase and consume Logic Apps. Starting today, customers have the option to purchase Logic Apps as a standalone service or continue to use current pricing plans such as App Service or IoT Suite. To learn more about purchasing options, please visit the Logic Apps pricing page. As we continue on this journey to empower our customers to stay more agile and be more productive, you will hear more updates from me on our investments and how we are delivering against our goals. In the meanwhile, please share your comments and continue to engage with our teams.